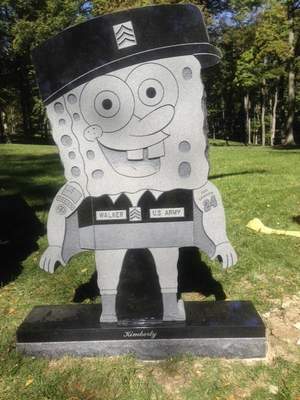 The reports out of AP and others is that Spring Grove Cemetery in Cincinnati has evicted a monument of SpongeBob SquarePants after originally admitting it, claiming it to be inappropriate. The legal argument (of course) pivots on a cemetery being like a condominium, though anyone who has visited one will attest that no one is living there – the cemetery, that is. Now the grieving are really aggrieved. Monuments are forever. No peace to be found in Spring Grove until this enduring dilemma is resolved. In a 6-16-13 post entitled Punctum, All Of The Noose That Is Knot considered Eric S. Jenkins’ insights on a Barthesian Punctum within animation. Setting aside Barthes’ obvious corollary of mortality applicable to Spring Grove, what Jenkins had to say on a different matter creates some genuinely eternal concerns. “The punctum of animation, although likewise a punctum of “Time,” is about life rather than death… Jones [famed Warner Brothers animator Chuck Jones] might depict the character moving and expressing, but Bugs lives beyond the drawings. This child expresses animation’s punctum, sensing as alive that which exists only as image.” (Critical Inquiry Vol. 39 No. 3 pg. 585) This last line likewise could be used to describe an angel, of which there are probably a considerable number adorning monuments throughout most cemeteries. The Walkers, whose daughter Kimberly the monument is meant to commemorate, now may have recourse on aesthetic and cultural grounds. “Animation, animated subjects do not exist, have never been, share our world and experience only through the image, nothing more.” (this blog’s 6-16-13 post, Punctum). As much could be said for angels, though many, like the child recounted by Chuck Jones, actually see and believe in their actuality. This brings up an even gnarlier quagmire than the often related joke about Catholics in heaven (will anyone of another faith be there?). If our cemeteries are “populated” by what comprises our democracy (though strictly prohibited from being able to cast a vote by our boards of election), who determines the aesthetic, cultural appropriateness of commemorations to be found there? Recollection returns the admiration Dr. Tew expressed for the single, solitary bee during some long ago assembly of Ohio beekeepers. He was awestruck that this individual would exit the colony where there is the support of her fellows, and the safety of numbers, to fly off into the great unknown. I guess it stuck with me by the way he presented it, rather analytically from a scientist’s perspective – someone who has spent his life studying bees. We tend to knee jerk anthropomorphize anything not “like us”. Forgotten is that butterflies, bees and other insects don’t “know” what is out there. Off they go into the very, and always, immediate unknown. My neighbor is not right. No, not in an argumentative sense, rather he has been unlike his fellows in thought, behavior, and socialization since birth. Today I guess he would be described as challenged, or severely disabled though he gets around and lives alone. Many of us who live around him would describe him as a pain since it is almost impossible to communicate with him. He demands, and if the demand is not met, he curses loudly and vehemently (disabilities are not always as portrayed by Hollywood). Of late he has deemed himself to be our self-appointed evangelist. Have you gone to church? No matter what the response, he condemns you to hell (perhaps he’s lonely?). The latest is asking what is written on a piece of paper in his hand (which the committed do-gooder is more than willing to read for what he believes to be an illiterate. Not!). The scrawl spells “dread”, and of course, a sermon on going to hell with a veritable Whitman’s Sampler of assorted gospel invectives follows. In The Gleam Of Light: Moral Perfectionism and Education in Dewey and Emerson (2005) Naoko Saito tries to show the close connection between Dewey and Emerson, through some of the writing on this matter by Stanley Cavell (who considers the opposite). Emerson’s influence appears in Dewey’s early work and then in his later writings according to Saito. She addresses a major criticism of Dewey in a chapter entitled The Gleam of Light Lost: Transcending the Tragic with Dewy after Emerson, something both Emerson and Cavell address and wrestle with but Dewey is considered to have elided (all problems can be solved through a sound pragmatic approach). Curious insights that speak to our time arise out of the considerations of these various thinkers that Naoko brings together. Emerson (and then later Dewey) mourns/bemoans the “lost individual”, asleep to the life within/without ( Shades of the unexamined life is not worth living!). The emphasis with Emerson, and later through Saito’s interpretation of Dewey, is on setting forth, struggling to create/achieve meaning, to learn, to grow. Of course, no apparent end is given for all this setting forth, learning and growing. In contemporary times, this has been perverted as “process” – i.e. process art, or “the learning process”, etc. (but not processed food). The “process” has become the end (something Saito points out is NOT the case by referencing the role and place of imagination with morality in both the writings of Emerson and Dewey). Saito works hard to stress the difference between the valorization of today’s “process” and the role or place of struggle, setting forth, growth, etc. with Emerson, et al. She writes: “[T]he good is anything but guaranteed in advance; it is to be created ahead, as “consequences” in the future, or as Cavell says, proven only on the way. Potentiality is not “a category of existence” that is being unfolded. Instead, “potentialities cannot be known till after the interactions have occurred” in terms of “consequences”” (pg. 116). With the solstice come the summer reunions, fish fries, get togethers. Days are long, weather is warm, and there’s no end to reasons for communing with one’s fellows. After readings of democracy by Dewey and Ranciere, Ding Politik with LaTour and Irigaray’s “we are at least three, each of which is irreducible to any of the others: you, me, and our work” one experiences a totally new appreciation of this ritualized carnival. Ritualized in that a certain degree of decorum and appropriateness is forever maintained. Carnival in that it comes across literally like something by Bukowski or visually by Reginald Marsh. Nothing like communicative democracy, you say. But context is everything and democracy seems to be the last consideration found at these events. There seems to be more of the primitive power structure embraced so hardily by ancient texts of social anthropology or psychology. Potlatch. One abides. Abides by one’s station, the spouse, or an unwavering allegiance to one’s children, no matter what the history (known or unknown). The groupings of individuals likewise follow what colloquially was once referred to as “the peck order.” Conversations never “communicate” (as in “communicative democracy”), but rather establish positions, areas of influence, boundaries or horizons. Who cares about the “real” world or what “really” might be out there. What one does, where one belongs, how one fits trumps any talk of what could be, or what is possible. It is a material world with a preordained material social order. Celebration is only from within the place of that structure. And, we are here to celebrate summer, aren’t we? One wonders what all the reading, thinking and imagining with regard to democracy is all about. When it comes to the summer outdoor social, all that seems to evaporate. Where does it go? Was it ever there to begin with? Decisions are already made a priori. The chef’s apron says it all, “Take it or leave it.” Continuity of tradition, of hierarchy and jockeying within that hierarchy (of both immediate social interaction and communally re-created history, tradition) are all that matter. People “wear” themselves – in their clothes, what is written on their clothes, on their bodies with ink, what they arrived in, the beer, wine, liquor, water or pop they are drinking, smoking or not smoking, paper or plastic. Now’s the time to tell the world who you are! But please, don’t speak of “we.” This is home, this is family. Adorno’s “it is part of morality not to be at home in one’s home.” certainly is not at home here. “After all, if you can’t abuse your own family, who can you make fun of?” spoken in absolute earnest and candor by a regular participant, an actor, a player. No, democracy seems to be what takes place when we are all strangers, don’t know each other at all, have no reasons but problems to get together over. What takes place amongst friends, intimates and acquaintances is older, more primitive, primordial. Democracy it ain’t. How many times have we heard that? Is it doing any good? If not, why not? What alternative approach could there possibly be? Why can’t we imagine it? We all know (ala knee jerk reaction) that taking “that information and do[ing] what they want with it” can span the spectrum of responses—from creationist fundamentalist religious ones, to economic conservative or liberal ones, from I’m-aware-of-a-lot-of-things-let’s-not-rock-the-boat to radical activism. Providing information for the recipient to “do what they want with it” doesn’t work. It fails because it does not produce the intended response– folks actively engaging in the “cause” to produce the demanded change. Sounds reasonable and liberal enough. I give people a plethora of information. They can’t help but conclude with the hoped for response. And yet repeatedly THAT is not occurring. Why not? Upton Sinclair writes The Jungle. Readers are outraged that this is what is involved with the food they eat. Because it is not good for the public health and environment there is a demand for change. Change occurs. This is the historic narrative approach. The narration, as all narrations do, follows a this, then this, then this time line model. Repeating the narration repeats the time line model. The historic approach (implicated by a time line) leads through the present into the inevitability of the future. Being inevitable creates some urgency—resist (facilitate change) or be overcome by the anticipated march of history. This was the approach with regard to most matters leading up to the end of the twentieth century. A simple but effective logic that contributes to the formation of what Ranciere regards as “sense”. Previous posts of this blog have been investigating video in contemporary culture, especially the aspect whereby video performs memory, producing time and difference. Here’s a time lapse video of a glacier disappearing. Want to see it again? Here’s a Michael Moore film on the easy accessibility of guns in our society. It is filled with a lot of information. Let’s replay the Michael Moore film. Video performing memory, as opposed to narrative (re)constructing memory along a “first this, then that” basis (narrative always begins and inevitably ends, even when repeated), dispenses with the inevitable and its implication of urgency. Want to see that glacier disappear again? There is no connection between this performed memory of the glacier disappearing (which we can repeat ad nauseum) and any inevitable outcome of this memory, with any urgency to act on some (nonexistent) inevitability. “We want to raise public awareness on this issue, and people can take that information and do what they want with it.” And many things are done with this information, as many things are done with videos. So what works given that the obsolete narrative approach and the contemporary assumption that creating awareness will produce an inevitable intended response don’t? Video as communication of ongoing event seems to be especially effective in generating the desired inevitable response and its needed urgency. Whether natural disaster, victim account, covert filming of illegal activity, etc. video presentation becomes akin to Sinclair’s presentation in terms of ultimate outcome. But this brings us to privacy concerns, Occupy and eventually, the current ongoing discourse on “the right to look.” Occupy seizes on the “public”-ness of public space. An analogous scenario could be made for the various “public” rights of expression, freedom of the press and dissemination of information, universal internet access, etc. Privacy rights and laws are becoming ever more a priority for the 1% determining our governance. The right to look is not found anywhere in the document drafted by the eligible 5% who governed the land, serfs, indentured servants, and slaves in late 18th century America. Please, oh rulers of our great land, we beg of you, let us look (and see), and communicate (via digital media) what is going on around us right now– not “to raise public awareness” but to communicate and act immediately, which is what we already do when we drive our cars and perform at work. Hmmm… Somehow that last line doesn’t look just right. Wonder why that is?